Amanyangyun – Dig Delve – An online magazine about gardens, landscape, growing & making. I have recently returned from the opening of one of my biggest projects to date and feel the need to tell the story, as it is remarkable for its scale and farsightedness. Mr. Ma, our client and the visionary behind the forty-five acre development, started the journey over fifteen years ago. 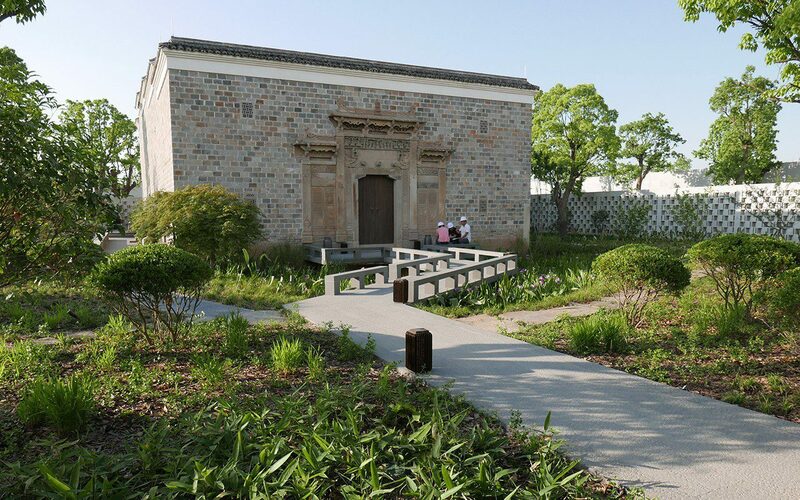 A dam was about to be built near his hometown in Jiangxi province south-west of Shanghai, and with its construction came the loss of the valley’s ancient camphor trees and Ming and Qing dynasty settlements of merchants’ houses. 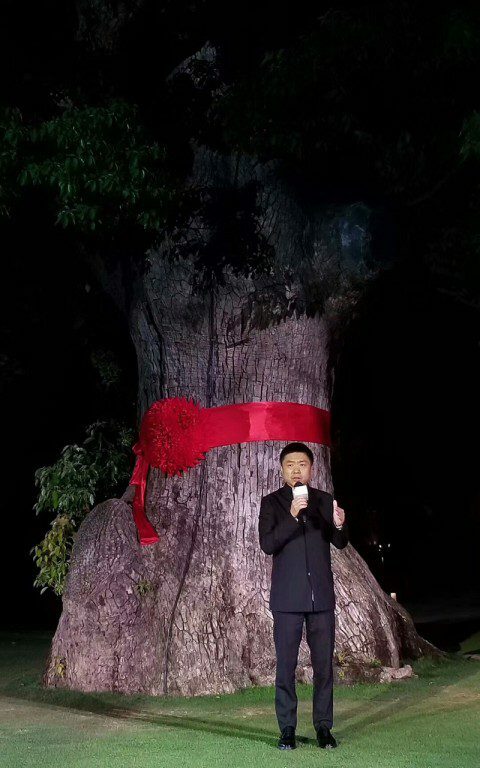 By the time I came into the story, and indeed it was the reason that I did, Mr. Ma had moved over ten thousand camphor trees to their new home in Shanghai. Their journey was an extraordinary one. 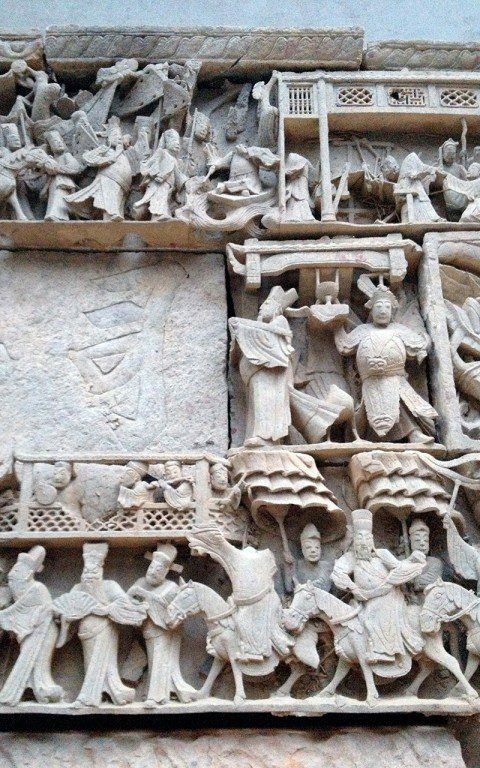 Some are believed to be almost two thousand years old and were so big that they had to be transported the 600 kilometres on army tanks. Bridges had to be made to get them across rivers, and tunnels excavated so that the cargo could pass. 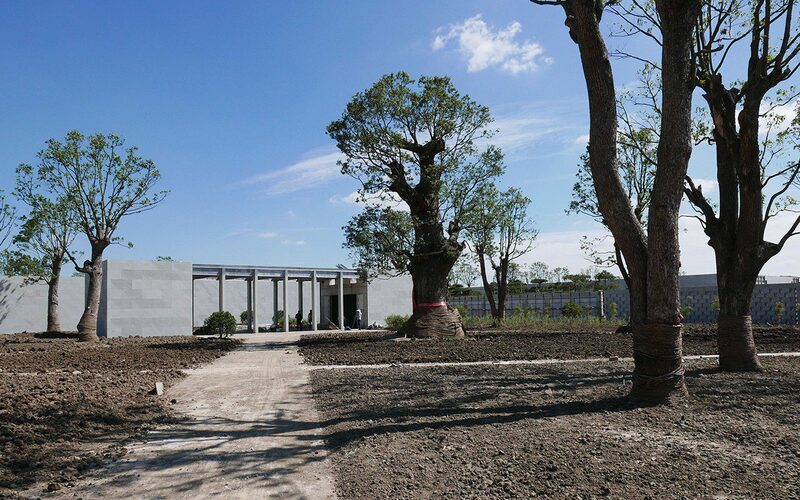 The trees were planted in a nursery on the outskirts of Shanghai, very close to a site which Mr. Ma had secured for a new development. 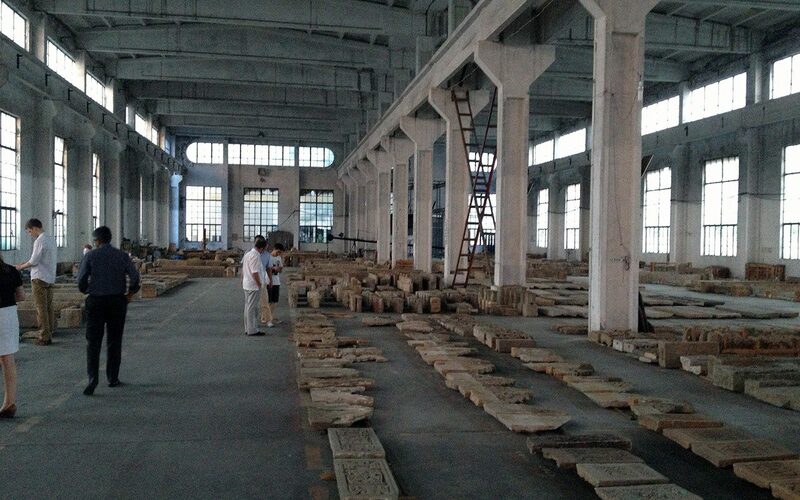 Here a series of old warehouses were also repurposed for storage of the merchants’ houses which had been dismantled brick by brick and painstakingly repaired from the damage they had sustained during the Cultural Revolution. 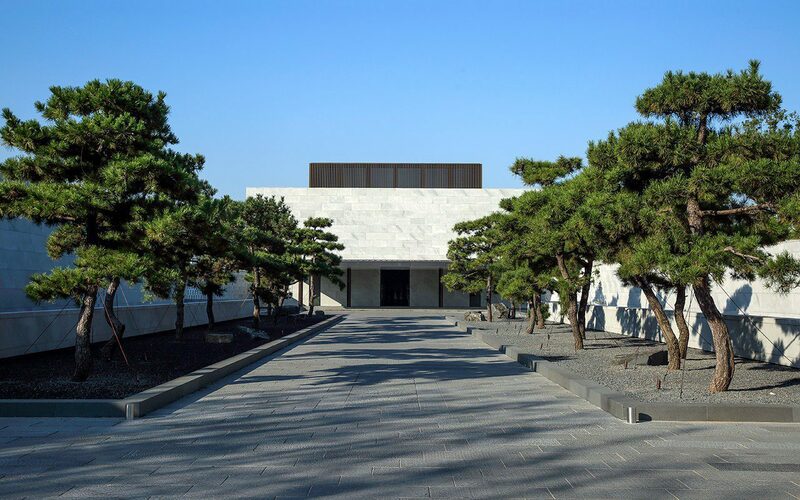 I was introduced to Mr. Ma in 2012 by his friend and collaborator Han Feng, who had been tasked with helping to find a landscape designer to design the grounds. Han Feng and I had met at the Design Indaba in Cape Town earlier that year, where we had both been invited to speak and we met in London to talk about the project. I was inspired by the story of the rescued camphors and the idea of making them a new home, so we agreed to meet Mr. Ma when I was next in Japan at the Millennium Forest so that he could see my work there. 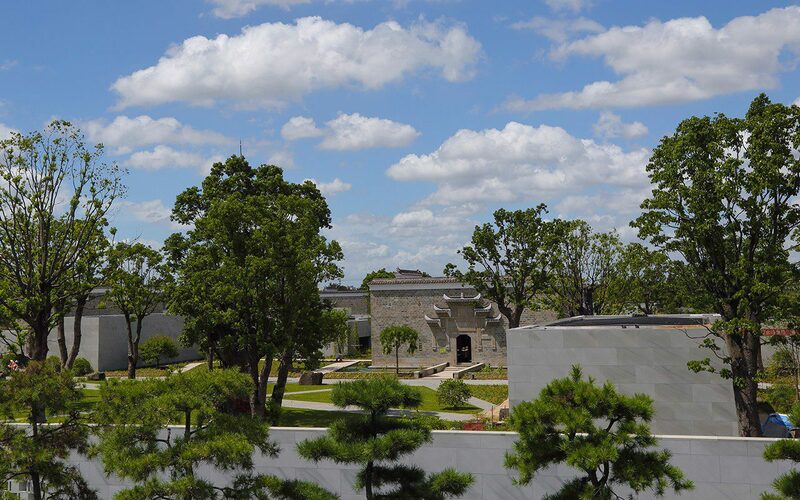 By this point Aman Resorts were collaborating with Mr. Ma to make a hotel and associated grounds and Kerry Hill Architects had worked up a masterplan for the site. Once I was on board we were tasked with detailing the whole site from the hotel to the streetscapes and a series of garden blueprints that would be used to furnish the gardens of 44 private villas; 26 antique merchant’s houses and 18 contemporary interpretations of them. 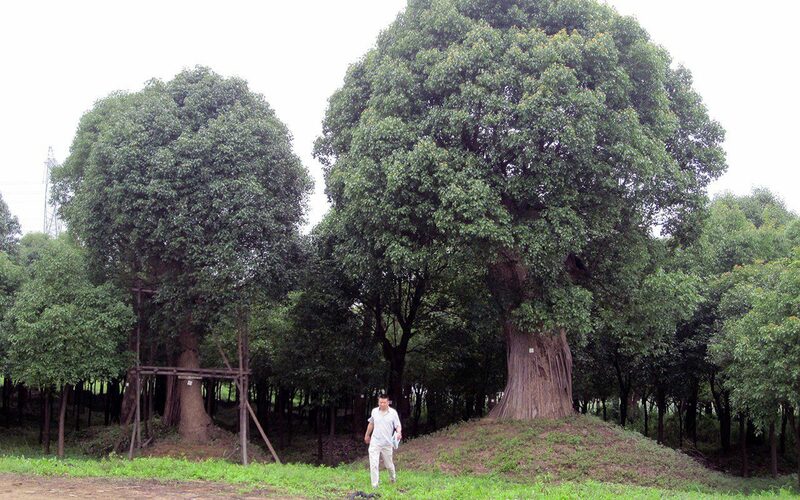 Mr. Ma was busily working away in the background with the government to secure a site of double the size that would become the backdrop to the development and allow the green lung of the camphor forest to reach out and take on this new ground. 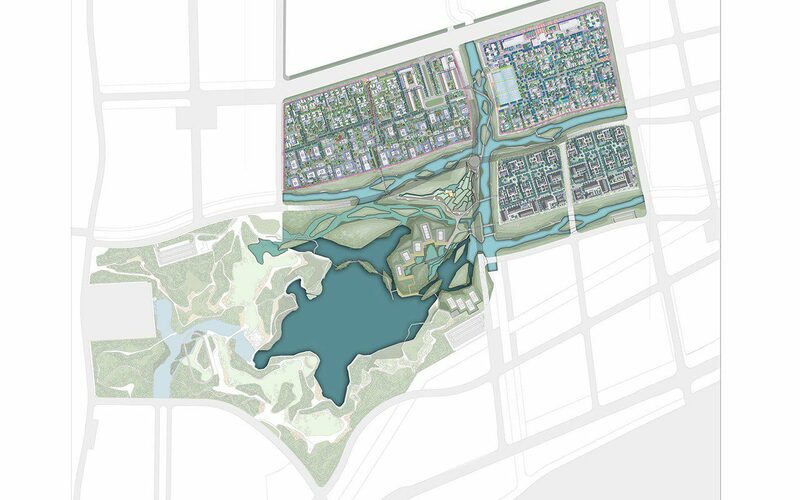 We were also tasked with designing the masterplan for the park, repurposing one of the agricultural canals to form a dividing lake and masterminding a wetland of considerable scale that would allow us to recycle and purify all the water that would be needed for the water features on the site. 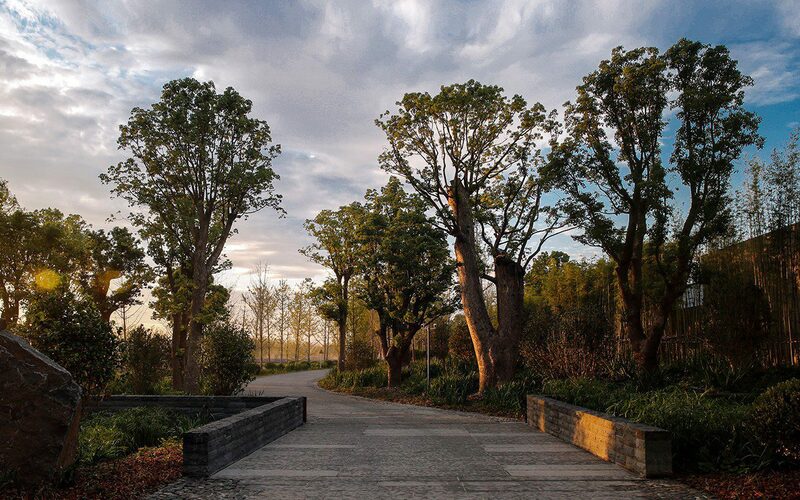 It was an extraordinary opportunity to create a public park that would also act as an environment to include wetland walks, meadows and a considerable acreage of woodland. A green heart for a new city that was quickly sweeping up and around the site, as the agricultural land was repurposed for the urban sprawl. 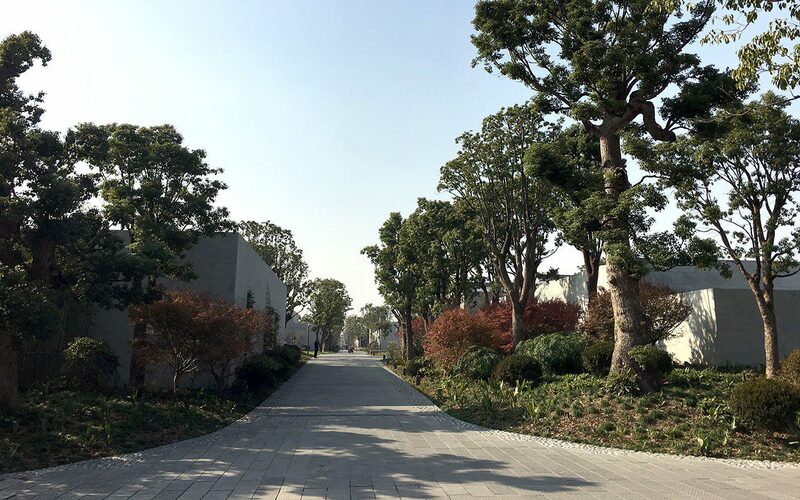 Once it was complete we passed the park masterplan on to a local firm of landscape architects and concentrated our energies on the Amanyangyun site. However, it is gratifying now to know that the first phase – the lake, the wetland and the woodland that links the two sites – is already in place. In China things happen at an alarming pace and at a scale that we are unaccustomed to here, so in many ways it was good to pull back at this stage after securing the big ideas and concentrate on the detail of Mr. Ma’s site. It took two years of careful collaboration with the architects, who were a delight to work with, clear in their thinking and open to the contrast of an informal overlay on the rigorous grid that defined their masterplan. My own journey, and that of the team that works with me in the studio, was put on a very steep learning curve. We had to learn fast about the very different cultures and way of doing things and we couldn’t have done that without the trust and thoughtfulness of our client who had put a team in place that helped to translate our ideas. We were taken to see traditional Chinese gardens to understand their ethos, aesthetics and cultural importance. They were completely new to me, the precursor to the Japanese gardens which I have come to know well from my time spent there, but entirely different in their aesthetic. 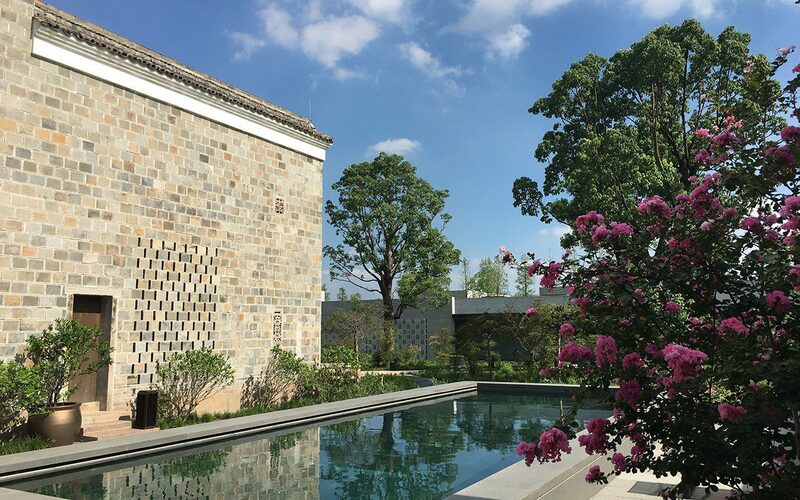 I was keen not to emulate the Chinese garden at the villas on the site, but it was important to understand the culture and how we could create something naturalistic that would sit comfortably in Shanghai and not feel out of place. We soon found that, despite the vast range of Chinese plants that we grow and depend upon in the west, our choices on site were very limited. The Chinese garden depends upon a tiny palette compared to a western garden and thus the nursery trade there is very limited. Bamboos, from ground covering forms to timber bamboos, were not in short supply, neither were Nandina and Osmanthus, but our tree palette was narrow, with only two magnolias to choose from, M. grandiflora and the beautiful M. denudata. 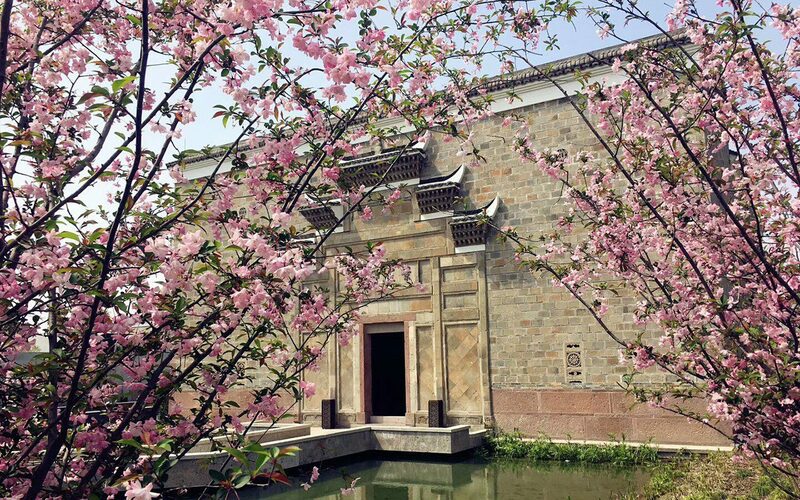 We had flowering Malus and plums, camellias and a number of auspicious fruits that we used close to the buildings. And there was no shortage of Chimonanthus so the building blocks were enough. It was what we did with them that made the difference. Modern landscape design in China sees the groundcover layer packed densely with blocks of low level shrubs, such as azalea and Fatsia, but I wanted breathing space between a multi-stemmed layer of flowering trees that would sit under the canopy of the camphors and keep the space at human level feeling airy and light. We designed a number of groundcover mixes that mingled the staples together informally. Ophiopogon and Liatris sweeping through in a gently shifting constant with runs of Aspidistra in the deepest shade, which was replaced by the likes of Iris sibirica and Chasmanthium latifolium out in the glades, where we had made room for the light to break the overarching canopy. 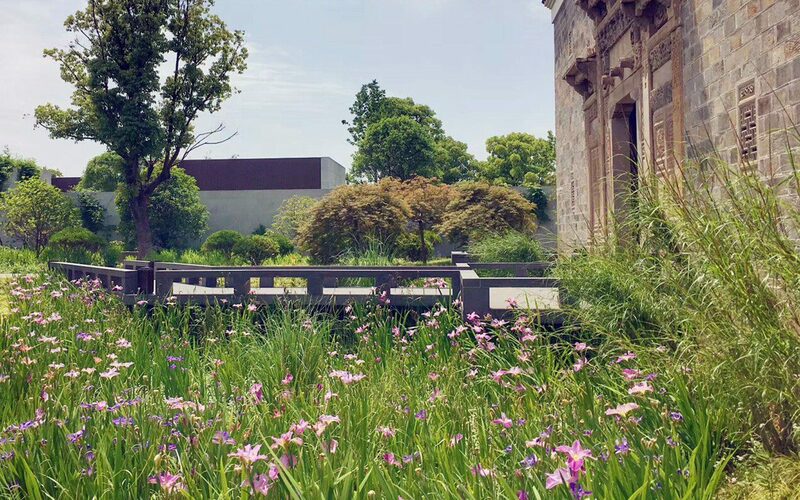 We used a palette of Chinese natives and local wetland species to encourage wildlife, but pumped up the volume amongst the restful sweeps of green with lotus ponds that sat close to the buildings, coloured Nymphaea in water bowls on the terraces and highly scented Gardenias by doorways. The climate, though temperate, is just that bit warmer than London so we were able to include bananas in sheltered corners and Trachycarpus for the grandeur of architectural foliage. After my initial dismay at the apparent limitations of choice, our palette soon felt big enough to do something interesting, but I did choose to import Hydrangea serrata from Japan, as we only had access to hortensia and H. quercifolia. By including the H. serrata we were able to ring the changes and make the development singular. Pink, white and ‘Macrobotrys’ Wisteria floribunda were also imported as we only had access to Wisteria sinensis, which is the shorter-flowered of the two species. These additions to the staples and the commitment to breathing spaces in the planting soon made the difference. We honoured the Chinese traditions with an auspicious fruit tree by every door and trees and shrubs that represented welcome or well-being and were well known for this layer of storytelling in the landscape. Our plans were all vetted by a feng shui master before anything was built – and we had to make some changes, but most of the moves in geomancy are based on good common sense and the changes were few. I suspect we were lucky. 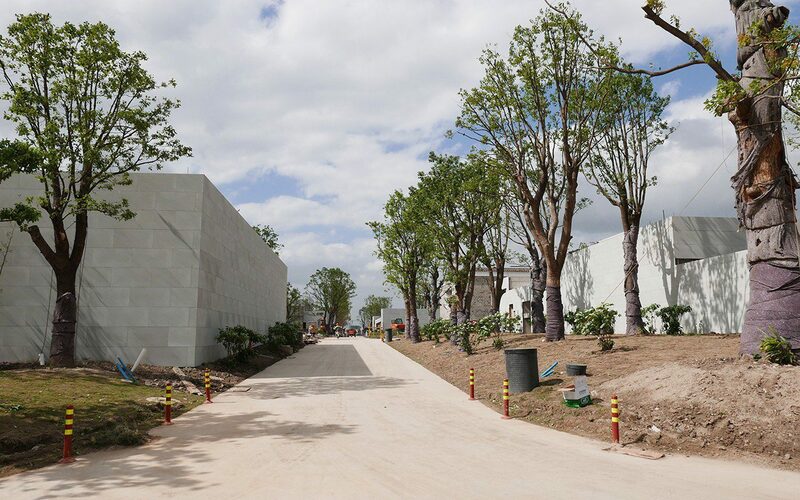 There are numerous tales to tell about how we got to the point that the hotel and the grounds of the first villas were finally opened this spring, but they finally are and behind the scenes work continues to complete the remaining parts of the site. Though the planting has been in a year at most, it is already beginning to pull the buildings together. 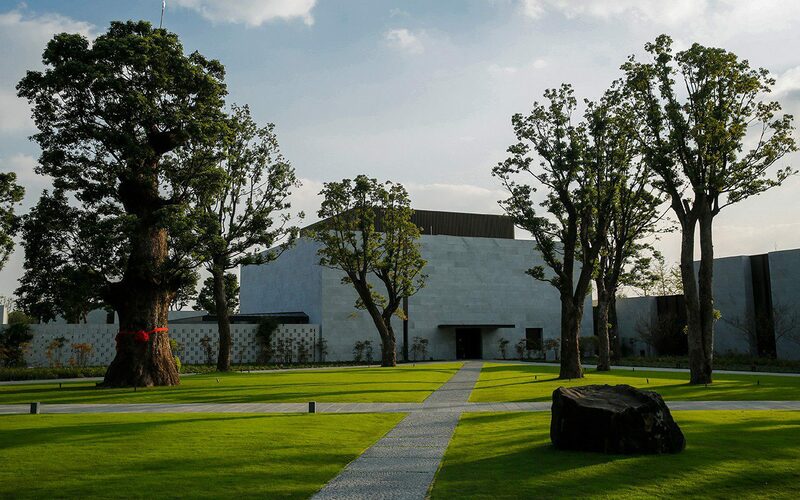 You look up to see the camphor trees regenerating, the King tree in the main courtyard already assuming presence. It will be a time before their branches reach to touch and cast shade, but it is good to have been part of helping them to do so.